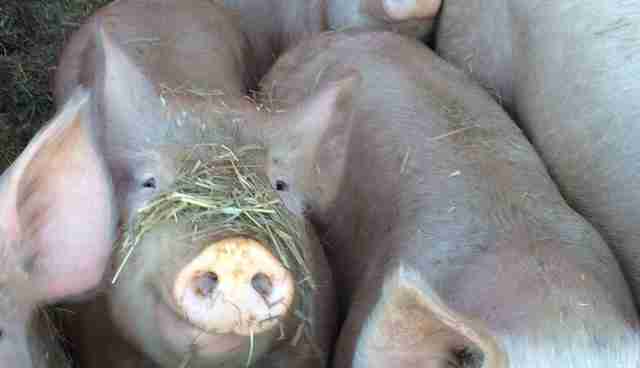 Five pigs were rescued from a Maryland property in January. 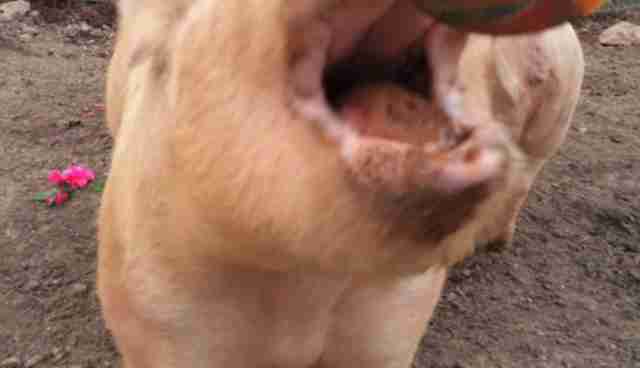 At the time, the pigs were sick, skinny and scared. They squealed and hid when people came near them - understandable, since they'd been seized from an owner who was charged with 31 counts of animal cruelty. 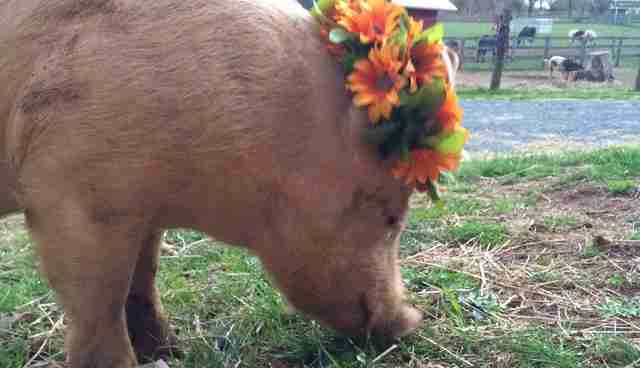 Within a few days, though, the young pigs had made their way to a horse farm in Maryland, to convalesce. They were given goofy names - Pigimuss, Maybelline, Tressa, Valeria and Fiona - and quickly came to discover that humans aren't all bad. 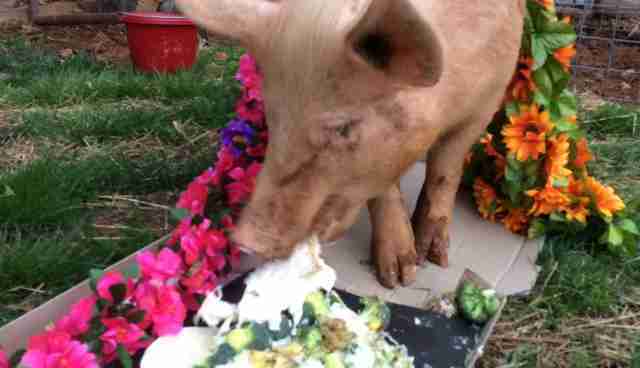 Some bring delicious breakfast and dinner for pigs to eat, for example. "And then they learned what a good belly rub felt like," Sarah Barnett, a volunteer with the Northern Virginia-based nonprofit Lost Dog and Cat Rescue Foundation, tells The Dodo. "They are sweet pigs." After several months of recovering physically, and getting used to some pampering, the "Maryland Five" have just become available for adoption through Lost Dog. Which raises some interesting questions about how best to showcase such creatures to potential adopters. 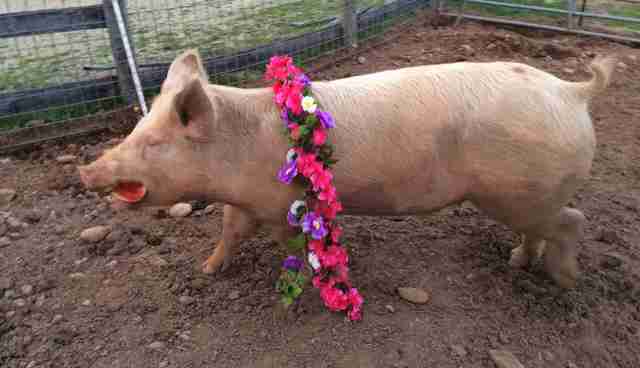 Pigs aren't always recognized as being the funny, charming, intelligent animals they are. "So, I was trying to think of how to market them, and it was a really pretty day out, and I remembered those pit bulls with flower crowns getting lots of interest," says Barnett. "Perhaps I could do something similar with the pigs!" 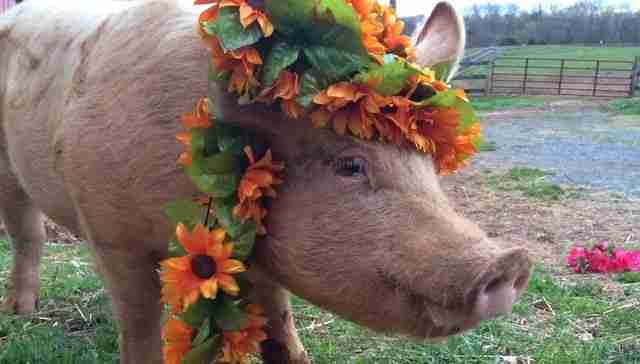 It was a long road to get these pigs to the point where you'd even try putting flower crowns on them, to show off how pretty and fun they are and try to win them some loving homes. Earlier this week, Barnett bought $79.82 worth of plastic flowers from a crafts store, along with a $2.99 lollipop, and some watermelon and broccoli. 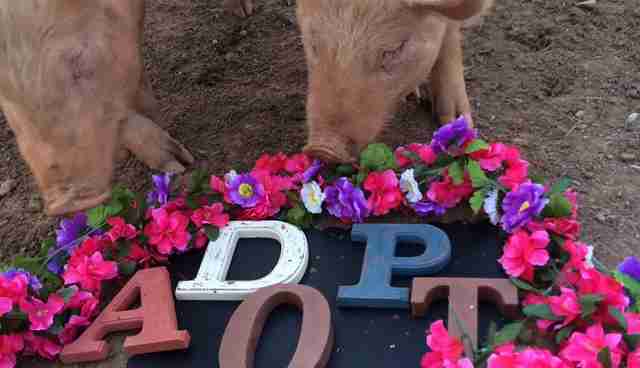 She arranged wooden letters on a board, spelling out "ADOPT ME." She laid it neatly on the ground, strewn with the tasty treats to get the pigs' attention at the right moment. 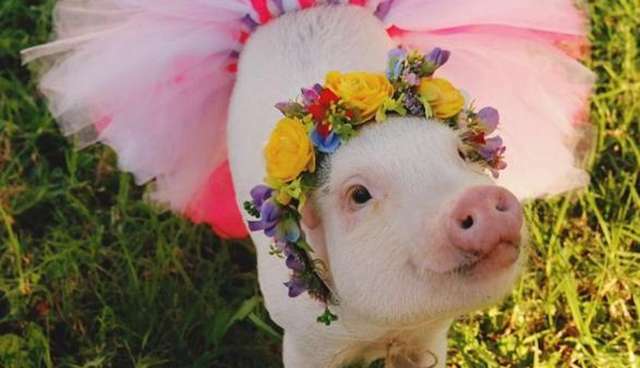 She was so pleased, imagining how precious and perfect the pigs' adoption photos would be. Probably something like this, Barnett thought: a series of shots evoking a magical fairy tale, like the ones featuring celebrity pig Hamlet. Hamlet on Instagram: "Join myself, @ichaity and @harrybarker_co and show your support of @sophiegamand's #pitbullflowerpower series. 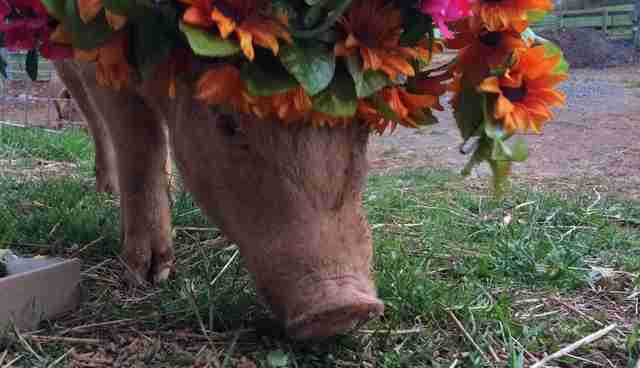 1$ per post is donated to..."
The Maryland Five pigs, not realizing they had some ethereal hooves to fill, stomped on their pretty flowers. They got mud all over the props. Pigimuss even grabbed some watermelon and ran off with it, "which, while annoying, was pretty funny," says Barnett. "I should've videoed my attempts. Them charging off with watermelon wearing flowers and trying to eat the 'ADOPT ME' board." So, the photos didn't turn out as Barnett planned. Not by a hundred pounds. In a way, though, the pictures Barnett got might be even better than the ones she imagined. After all, they give an extremely realistic sense of what life will probably be like with these little piggies: messy, fun and a little unpredictable. "I also wanted to show that they do have personalities," says Barnett, which she definitely accomplished. These pictures show something else, as well. Something as tremendous as these pigs themselves will eventually be. Pigimuss, Maybelline, Tressa, Valeria and Fiona now have people who care for them very much. After a rough start to life, with an owner who let them starve, they are now loved, and they are valued by the rescuers who took them in. Lost Dog and Cat Rescue Foundation is asking for donations to help cover the costs of caring for Pigimuss, Maybelline, Tressa, Valeria and Fiona, whose food bills are upwards of $1,000 per month. Here's where you can apply to adopt one or more of the Maryland Five.